I don’t much like either ham or cola and I can warrant that combined, the two are pretty pleasant. Dear God, I’d marry you if we both didn’t allready have husbands! Christ allmighty I think I may pass out from the decadance. Your right. Yours is better then Nigella’s. Impressive. Diet Coke – I’m not sure. Heat will do awful things to aspartame; it degrades in heat and loses its sweetness, as well as gaining some toxicity. 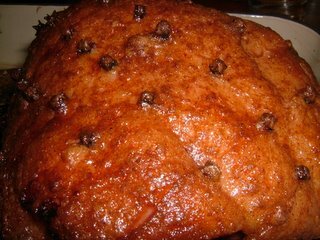 I have read a recipe where you cook the ham in weak coffee (with sugar and more spices). Perhaps that’d suit you better, without the sugar? Liz, my wife cooked this for me at the weekend. Was delicious. Thanks for the recipe. Though we have a lot of coke left over. Not sure what to do with it as we don’t really drink the stuff. I don’t work in IT you know! Maybe Nigella’s coke chocolate cake….. Your coca cola ham looks really good. I shall definitely try out the recipe and see what my friends think of coke and ham. Did you use a norml or fan assisted oven? What would teh temperatures be for a fan assisted? Think I will try this for Christmas dinner. Thanks a lot, you have made life a lot easier for me! Hi Michelle – my oven is fan-assisted (although my experience is that there isn’t *that* much difference – only between 15 and 20 degrees). So you can comfortably set that dial to 200. GAWD – this is the best recipe on the internet! Thanks so much. I think I love you!! I've been asked to cook 2 hams plus Boston baked beans for 230 people – you've given me the ideal combination! Thank you thank you! Do you soak your ham overnight to get some of the salt out? My mum does this but I'm not sure if its necessary for this because I've never cooked a Ham before. Hello again! No, I don't soak it before cooking – it really doesn't need salting when poached, and hams these days tend to be a lot less salty anyway. I really want to do this for Chritsmas Day, can I do the simmering,the night before. Then do the glaze and oven bit Christmas Day ? Hi Sharon! I actively encourage experimentation and substitution – really glad it worked so very well for you! I’m trying this today! I have the coke and gammon joint at the ready… I just need the rest. I’ll let you know how it goes! Hi Liz, I’ve been wanting to try a good gammon and coke recipe for ages and I’m so glad I scrolled past Nigella’s version which didn’t look half as good as yours. I’ve got all the ingredients in but I’ve only got unsmoked gammon. Will this work or do I need to hit the shops again? It’ll be fine – and I’m very flattered! In the end, the smoke decision is entirely down to personal taste. Same with bacon; I massively prefer it smoked, but smoked bacon is considered such an abomination by my in-laws, for example, that they actually apologised for accidentally buying it when we visited a few months ago! Just to say great recipe. I have heard of this dish before. After all the comments from my friends and familly “you’re cooking it in what” then the stunned reactions of “wow that really works”. Will be cooking this again. Nice one! Hi Paul! Funny – it’s something to do with the time of year, but this seems to tick all my Christmas checkboxes at the moment. I’m making it too this week. Hi, this looks amazing, and I would like to cook it for Christmas dinner; can any aspect of it be done in advance? How long will it keep once cooked? You can poach the ham off in the coke well in advance, and from that point, thanks to all that smoke and salt, it’ll hang around happily in the fridge for a week. (It’s very good cold, sliced.) If you want to roast it and serve it hot on the day, bring it to room temperature before you roast it. I’d do it at 180C for about an hour and a half (you’ll find it easiest if you use a meat thermometer), basting as you go, and covering the top with foil if it starts to catch. Merry Christmas! we bought a 5kg ham. how do I have to adjust cooking times? Cripes – that’s a ham and a half! Poach it for 35 minutes per kilo, and Merry Christmas! Can’t wait to try this for Christmas dinner. Would I be able to cook my 2.8kg ham in the slow cooker and how long do you think for?!?!? 1. Can I do any of the prep for this today? 2. I couldn’t find chipolte chili, what would be a just as good alternative? 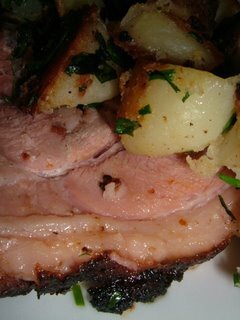 Absolutely – you can poach the ham today and keep it in the fridge until tomorrow, roasting it then. 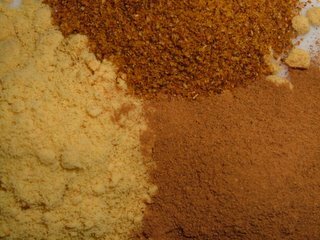 If you can’t find chipotles, don’t worry too much; smoked paprika is a good alternative, but if you can’t find that either just leave it out. Merry Christmas! And Gayle – I’m afraid I’m not any use at all around slow cookers! Can anyone else help Gayle out? I’ve just gone for it anyway…..it’s been in for an hour so far and it smells FAB!!! I can’t wait to prove the hubby and kids wrong!! Gayle how did the ham go in the slow cooker? OH MY GOD!!!!!!!!!!!!!!!! It was AMAZING!!! Thank you, thank you. I did it in the slow cooker, 4 hours on high/medium and it was absolutely fab! Hiya, i have got a high stress “Come dine with me” competition with brother in law and best friend. Bro in law was useless, now its my turn! cant really cook but really fancy doing this…what can go wrong please?? Happy New Year. If you follow the recipe to the letter, there’s basically nothing that you can get wrong. If you’re really worried about it and don’t cook much, I recommend a trial run – enjoy, and good luck! Just had to add….. I’ve never been a big lover of gammon but my other half was desperate that I try to cook one after 8 years of living with him…..so I bought the gammon on Saturday & been trying to find a way to cook it he will not have heard of….so I’m trying this for tonights dinner……it will be my two sons 1st experience of gammon too….wish me luck……???? I hope you and the demanding men in your life enjoy it, Gillie! Might I suggest you try this with Full Fat Dry Ginger Ale too – it’s a revelation! I am going to try this recipe for Christmas. I have never cooked a gammon before but all these positive comments have inspired me plus I am really intrigued with the concept. I think my husband is expecting me to make a mess of the whole thing but I am hoping to prove him wrong! ooooooooooohhhhh, am so excited, i’m trying this recipe for the first time……only cooked a turkey once so not the most experienced chef!! An American friend of mine puts cayenne pepper in hers and i mite try that too. Happy Christmas everyone!! If you cook it the day before, do you let it cool overnight still in the Coke cooking liquid, or take it out and drain it? I’d recommend leaving it in the stock overnight for maximum flavour, but drying it off won’t hurt it. Thanks – it was lush! I thought it seemed possibly a long cooking time (Delia only cooks hers @ 1kg for an hour30 in cider before roasting)but it was fab. Everyone said they enjoyed it more than Christmas lunch! Genius. Hi! 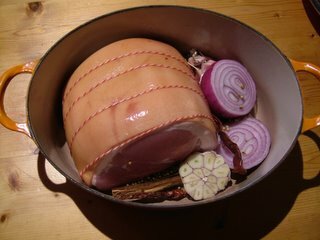 My ham is just over 2kg this year, how long will it need? I was going to just double the times but wanted to make sure! I love this recipe and so glad you still have it up on the website! I’ve been making this ham for the last 5 yrs and it really is the one that everyone likes. Even after 5 years, I still get asked for the recipe. If the ham doesn’t get eaten in the first sitting (highly unlikely) it keeps fantastically in the fridge.